I had a very bad lunch today. But not because of what I ate. My lunch was unpleasant because I moderated a noontime panel on Capitol Hill featuring Senator Ron Johnson of Wisconsin and my Cato colleague Chris Edwards. And I should hasten to add that they were splendid company. The unpleasant part of the lunch was the information they shared. The Senator, in particular, looked at budgetary projections over the next 30 years and basically confirmed for the audience that an ever-expanding burden of federal spending is going to lead to a fiscal crisis. To be blunt, he showed numbers that basically matched up with this Henry Payne cartoon. Here’s a chart from his presentation. It shows the average burden of spending in past years, compared to various projections of how much bigger government will be – on average – over the next three decades. The Senator warned that the most unfavorable projection (i.e., “CBO ALT FISC”) was also the most realistic one. In other words, federal spending will consume a much larger share of economic output over the next three decades than it has over the past two decades. But our fiscal outlook is actually even worse than what you see in his slide. The Senator’s numbers are based on average spending levels over the 2015-2044 period. That’s very useful – and sobering – data, but if you look at the annual numbers, you’ll see that the trendline gives us additional reasons to worry. More specifically, spending for the major entitlement programs (Social Security and Medicare, as well as Medicaid) is closely tied to the aging population. So as more and more baby boomers retire over the next couple of decades, spending on these programs will become more burdensome. In other words, our fiscal problem will be much larger in 2040 than it will be in 2020. Here are the long-run numbers from the Congressional Budget Office. The blue line is federal spending on various programs and the pink line is total spending (i.e., programmatic spending plus interest payments). And keep in mind that these numbers don’t include state and local government spending, which presumably will chew up another 15 percent of our economic output! 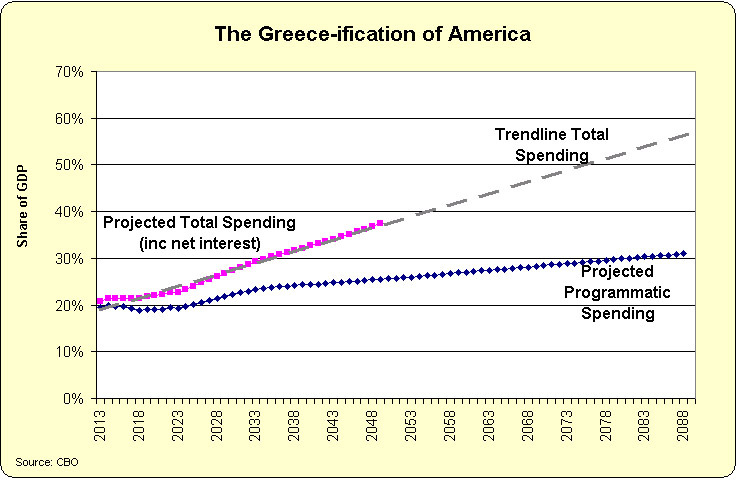 In other words, America will become Greece. 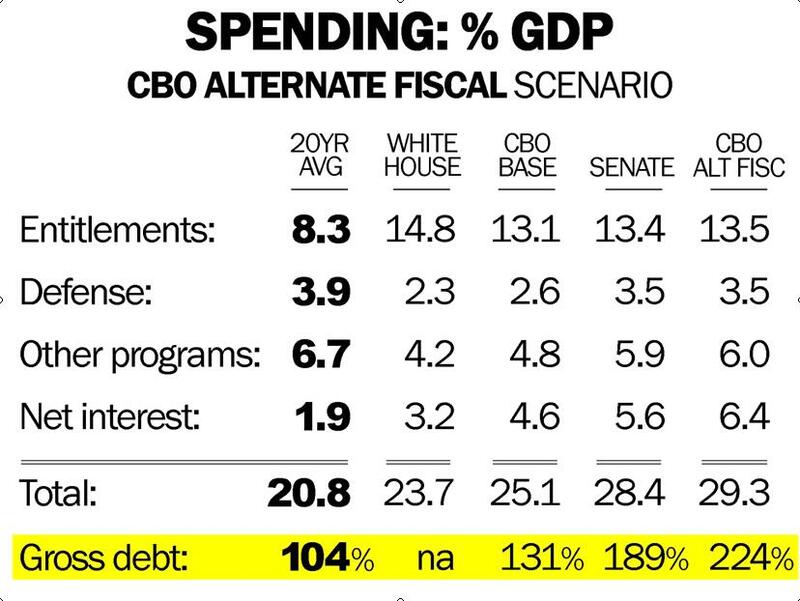 And don’t delude yourself into thinking that CBO must be wrong. I’m not a big fan of the Congressional Budget Office (particularly CBO’s economic analysis), but these numbers are driven by demographics. Moreover, CBO’s grim outlook is matched by similarly dismal numbers from the IMF, BIS, and OECD. By the way, CBO doesn’t do projections once federal government debt exceeds 250 percent of GDP, so the gray-colored trendline beginning about 2048 is not an official projections. It’s merely an estimate of the total spending burden assuming that the federal budget is left on autopilot. Of course, we’ll never reach that level. We will suffer a fiscal crisis before that point. But when it happens to us, the IMF won’t be there to bail us out for the simple reason that the IMF’s credibility is based on the backing of American taxpayers. And we’ll already have been bled dry! So unless we find some very rich Martians (who are also stupid enough to bail out profligate governments), it won’t be a pretty situation. I’m not sure we’ll have riots, such as the ones that have taken place in Europe, but there will be plenty of suffering. Fortunately, there is a solution. All we need is a modest bit of fiscal restraint so that government grows slower than the private sector. That would completely reverse Senator Johnson’s dismal long-run numbers. And some countries have shown that multi-year periods of fiscal restraint are possible. The real question, though, is whether politicians in America would be willing to adopt the entitlement reforms that are needed to control the long-run growth of spending. The US economic model is based upon a Ponzi Pyramid. Ever-increasing GDP is assumed, and is a necessary element of the notion that present spending of borrowed money can be covered by future income. Even an elementary understanding of exponential growth shows that constant growth, even at low levels, inexorably leads to a graph which trends to vertical – in other words, GDP growth has to trend to infinity to accommodate constant increases. Such growth defies the limits of resources, and demographic trends. The model met the real world in Q1 2014, when GDP shrank by 2.9%. The decrease in GDP for the 1st quarter of 2014 is bad enough, but among the figures there is an even more shocking reduction in US exports of goods and services (8.9% loss), while imports of goods and services increased by 1.8%. The BEA reports the US trade deficit increased to $47.2 Bn in April 2014 from $44.2 Bn in March. The Current Account Deficit increased by $23.8 Bn to $111.2 Bn in Q1 2014. Unemployment is reported at 6.2%, but if calculated as done in the past, would be 24%. Some commentators put it at 27%. 60% of the jobs lost since 2007 have been high to medium wage jobs, 58% of the jobs created since then have been low-wage jobs. It does not matter much whether we blame Obama, Bush 1, Bush 2, Greenspan, Bernanke, Yellen, Congress, or anyone else. As of a couple of years ago, the total Federal Debt plus unfunded liabilities was estimated to be as high as $222 Trillion – far beyond the ability of the US to pay in future. Add to this: 1. Continuing QE and deficit budgets; 2. Deficits reported as about $500 Billion are about $5Trillion if measured by GAAP; and 3. The GDP figure of $17 Trillion published by the US Gov is wildly exaggerated (68% is retail sales, a very large portion of which is of goods produced outside of the US, for example). Far more is required than “modest fiscal restraint” and “entitlement reforms”. A fundamental realignment of the US economy and society is necessary, with huge reductions in government and personal spending (goodbye military spending and consumerism) and a return to manufacturing and saving. The wild party is coming to an end, and will come to a screeching halt (and a massive hangover) when the liquor store (the Fed) stops providing booze on the cuff. I have personally lived my entire adult life with the expectation (or should I say lack of expectation) that Social Security and other so-called entitlements will not be available when I would like to retire. You see, I am on the tail end of what they called the baby-boom generation, and those folks ahead of me will have take what is there. In fact, I don’t really ever expect to be able to retire, but that’s due to the fact I have a wife who is disabled, and will therefore need some sort of healthcare (ignoring Obamacare- it will likely disappear also- or be so overburdened as to not provide any assistance). However, because of that I have endeavored to create my own personal retirement plan. Now, I am worried that the government will so overtax that they will also look for ways to confiscate that. Having seen the fiasco that was Brazil in the 80’s/90’s, I know that governments can and will make those sorts of decisions when they run out other non-free market ideas.